One of the greatest challenge of a chef must be running an all-day dining restaurant in a hotel. 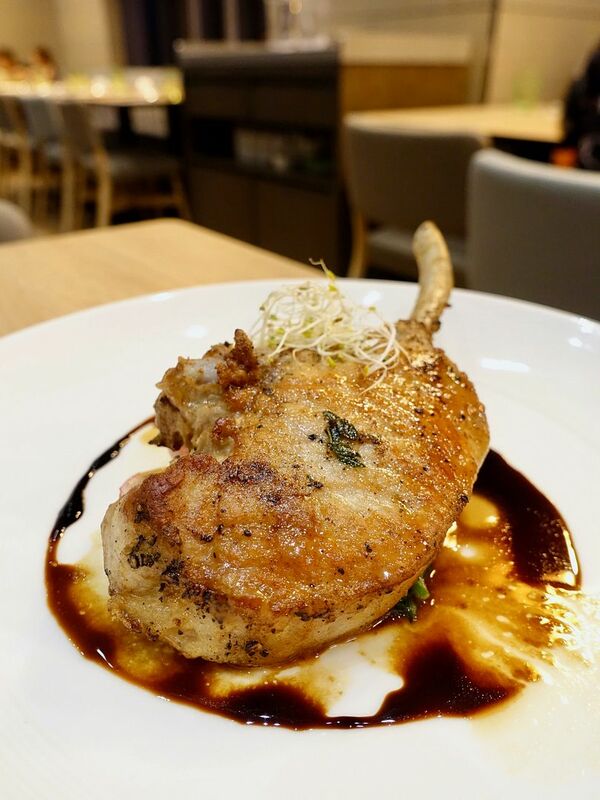 There must be a wide selection of dishes for guests of all nationality and ages, and a balance between serving Singapore cuisine and international ones. 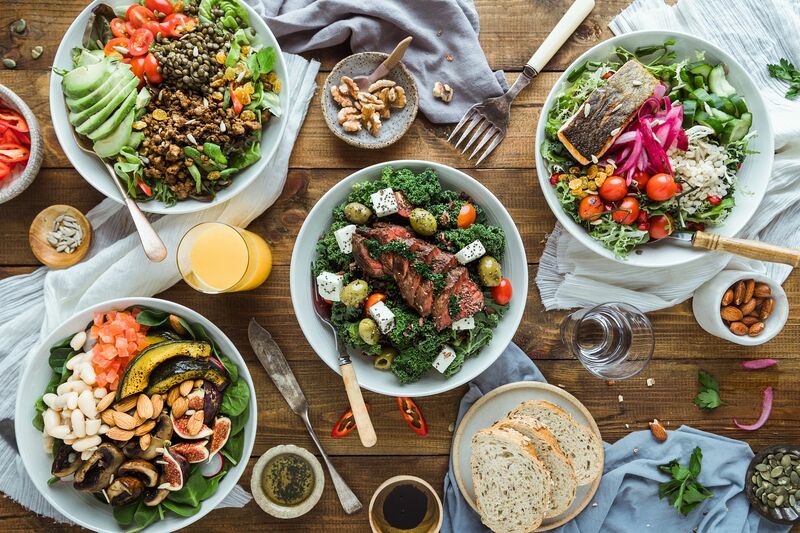 Now throw in the healthy eating trend too and get the chef to whip up a menu that incorporates all of the above! Thankfully for Courtyard by Marriott, they've found Executive Chef John Chye who managed to do all of that at Sky 22. Sky 22 is located on the 22nd floor of the newly opened hotel and diners get to enjoy an expansive view of the city area while dining. While breakfast is quite typical (western and local), lunch is more refreshing with the option to Build Your Own (Healthy) Bowl. 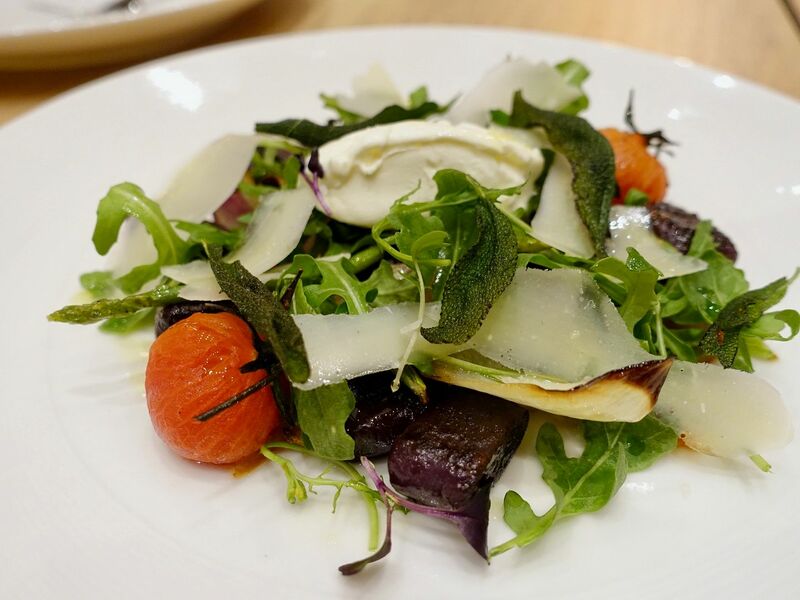 You'll taste more of Chef Chye's creations at dinner. Local flavors are infused into Western cooking and some of his inspirations come from dishes like Hakka Braised Pork, Singapore Chili Crab and more. Of course, standard Western dishes as thrown in for diners who are not that adventurous. A safe but tasty appetizer is the Oven-baked Camembert Cheese ($18). 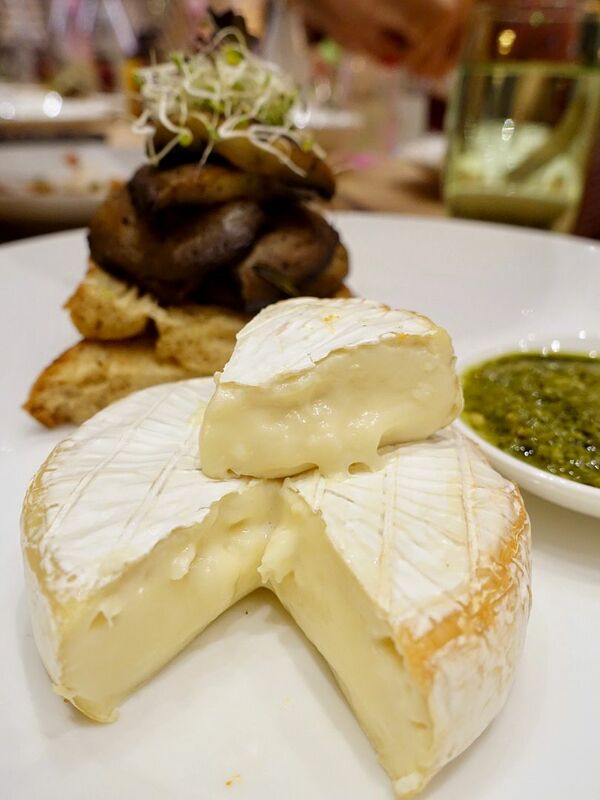 Somehow the saltiness of the Camembert was enhanced and it's gorgeous with the herby arugula walnut pesto and the earthy and tart Rosemary-balsamic portobello. Perfect combination on the crusty sourdough. Simplicity is awesome. An interesting twist on a traditional Malay dish in Singapore is the Nasi Ulam Wild Rice Salad ($22). 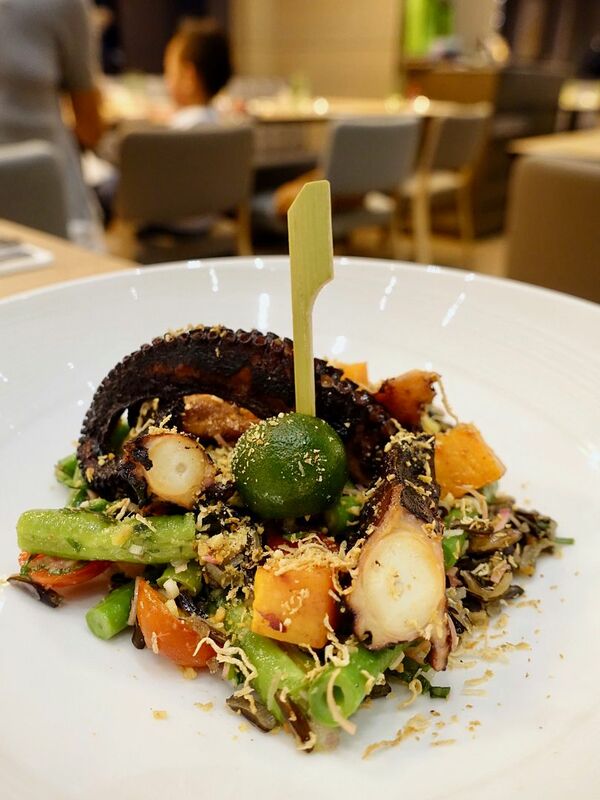 I've not had the actual dish before but this salad was an aromatic and refreshing mix of herbs and vegetables which includes betel leaf, ginger flower, toasted coconut, crushed peanuts, among long beans, sweet potato and charred octopus. The rice also provided a nice bite to the crunch of the vegetables. 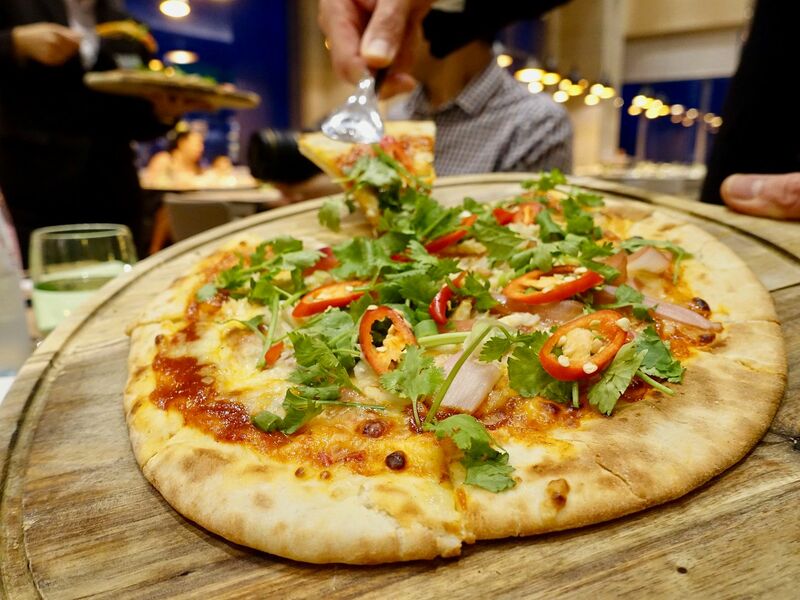 If you're looking for an authentic taste of the Singapore chili crab, pls do not order this Singapore Chili Crab Pizza ($26). It's really nothing like the actual dish (i thought it was rather sweet). I'm sure other flavors would fare better on the lovely pizza dough here. 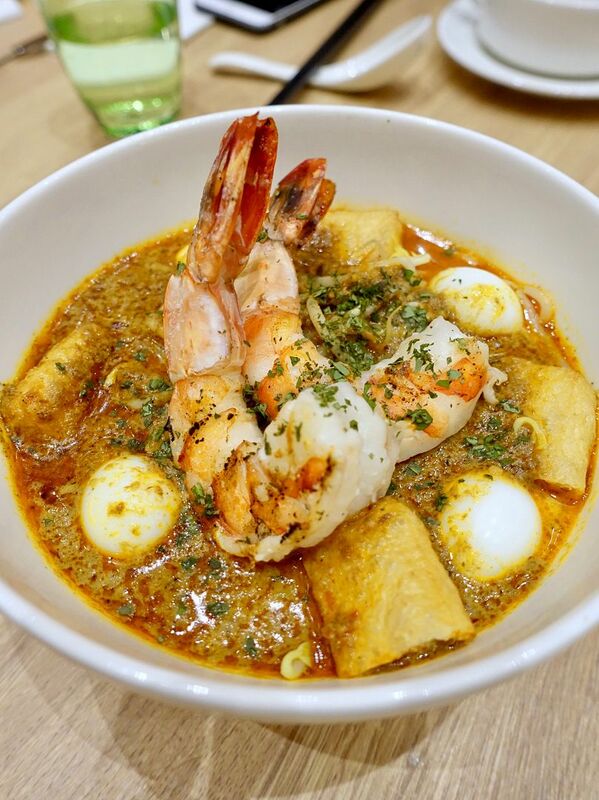 If there's something that you must eat at Sky 22, it's their Tiger Prawn Laksa Lemak ($18). I love this Nyonya style which is super lemak (coconuty) but not jelat (overwhelming).The vermicelli used had a lovely springiness to it and those charred tiger prawns were spectacular. I don't order laksa typically, but i will at Sky 22. A surprisingly Asian dish was the Purple Potato Gnocchi ($24), despite its Italian preparation technique and presentation. The gnocchi was chewier than the usual, and reminded me a lot of the Taiwanese sweet potato ball dessert/Korean rice cake in terms of texture and flavor. There's a slight sweetness to it, but it's balanced by the savory and citric mix of mascarpone, lemon, and burnt sage butter. It's not for everyone but i found it rather enjoyable. 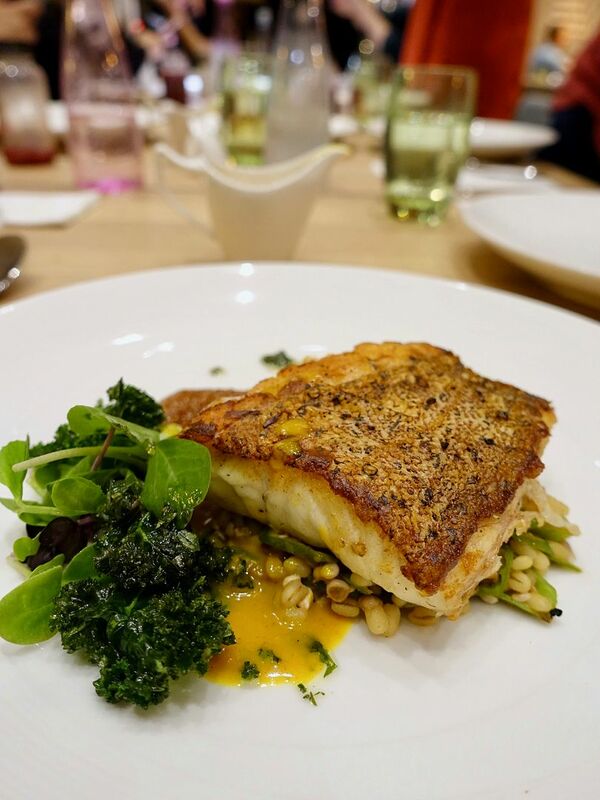 Other milder local flavors infused dishes include the Pan Seared Red-Spotted Grouper ($28) which is a super watered down version of the sambal grilled seafood at the famous hawker centers. You do get a nice fragrance of the spices sans the heat. As for me, i added a lot more of that turmeric coconut cream and sambal (shrimp chili paste) to my fish. The Iberico Pork ($36) took its inspiration from a Hakka slow cooked pork belly and fermented yellow soy bean dish. I can't comment on the similarity as the original is unfamiliar to me. Flavorwise, nothing outstanding. The meat could also be more tender (this was a huge chop). Lastly, have the Sky 22 Bubur Cha Cha Cup ($12) which left me wanting more of the original dish. 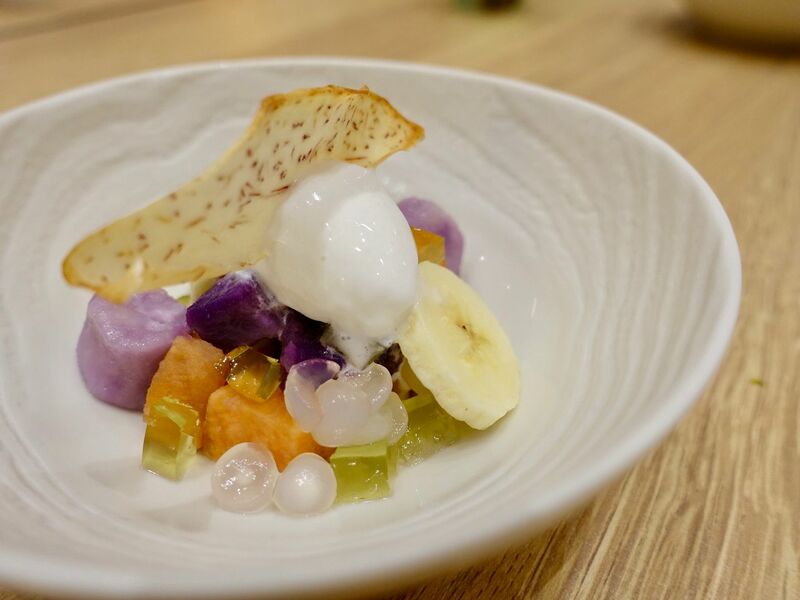 The coconut ice cream was delicious and i really wished there was more of it to submerge all the chewy starchy balls of sweet potato, yam, and sago. Ask for another 2 scoops of ice cream. You wouldn't regret it. A hidden gem is on the 33rd floor of the hotel, where Urbana Rooftop Bar is. 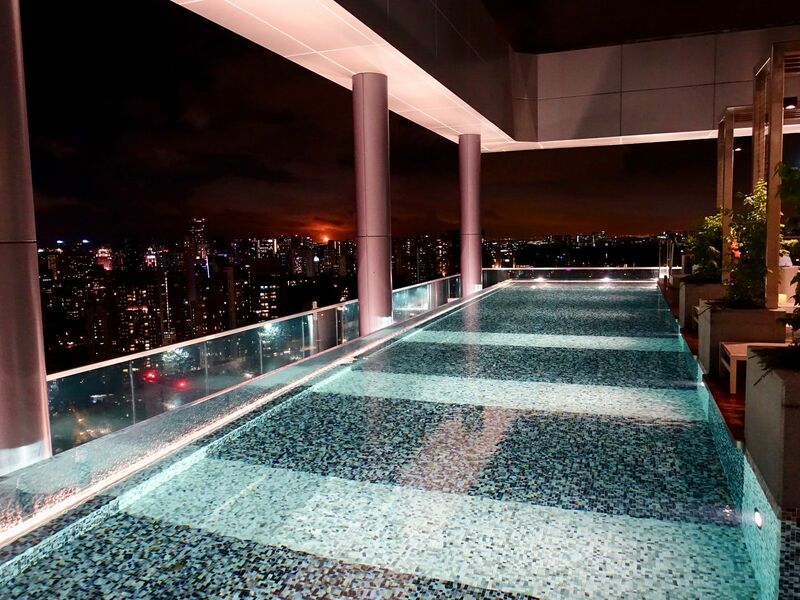 While you can't use the pretty pool (unless you're a guest), you could chill by the water with drink in hand while you enjoy the sunset or sweeping views of the skyline. Wagyu beef sliders, blue swimmers crab cakes and pork and pineapple satay are among the bar bites available here. 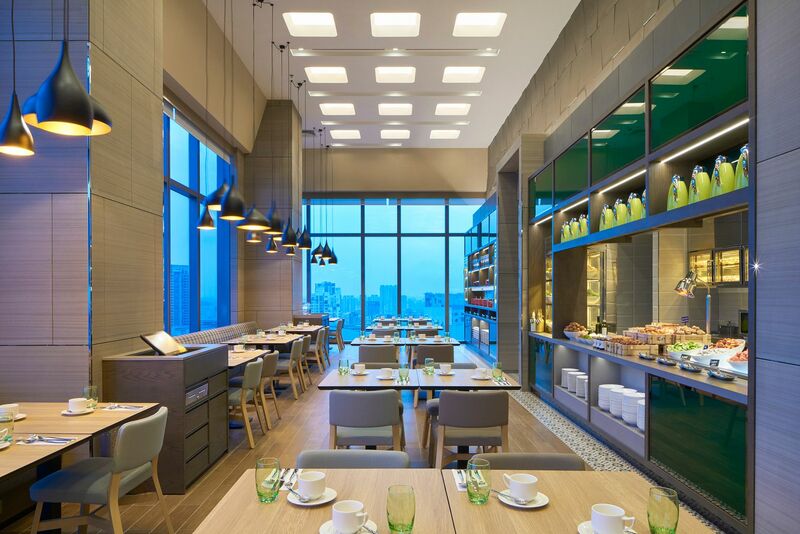 If you're looking to escape the mad meal crowd at Novena, Sky 22 at Courtyard by Marriott is certainly a good option. Verdict on Chef Chye's dishes? Man sure knows how to cater to the international palate while retaining the essence of our local dishes (sans the heat).